Dora at the Helike Early Helladic site (2500 BC) guiding the workers. I had the pleasure to interview Dr Dora Katsonopoulou, the Director of The Helike Project and the President of The Helike Society based in Achaea, Greece, since 1986. She is an archaeologist, a researcher, a consultant of international research programs and Board member of scientific Institutes and Organisations, a guest lecturer at Universities and Institutions, and she has organised four International Conferences on Ancient Helike and Aigialeia. She is the Leader of excavations conducted at Helike near Aigio since 2000. I contacted Dora in February 2013 and asked if she could cite my short story, Helike on the Helike Project’s website to help promote their work and the awareness and significance of the project and archaeological digs, but also for modern people to be educated, to relate to the history of Helike, and to place faces and names to the Greek citizens who were part of the tragedy when the town was lost in history, and lastly, for modern people to have empathetic understanding. My short story is about the destruction of Helike from the perspective of one of its citizens that I created, Alethea. Dora answered 15 Questions I had about her work directing and organising the project, the purpose of the project, and its aims for the future. This is an interview to commemorate her hard work since 1988. This interview was conducted by email in early March 2015. Ancient Helike is on the southwest shore of the Gulf of Corinth near Aigion, about 170km west of Athens. The ancient city was destroyed by an earthquake and tsunami in 373 BC. The Helike Project, under the direction of Dora Katsonopoulou and co-direction of physicist Steven Soter, began to search for the lost ancient city in 1988 with a systematic sonar survey of the seafloor southeast of Aigion. The survey determined that the site was not under water and since 1991 the Helike Project team carried out campaigns on the adjacent coastal plain using surface surveys, geophysical exploration, and extensive bore hole drilling. Since 2000 they started trial and systematic excavations under a permit from the Ministry of Culture held by the Helike Society and the Department of Geology of Patras University. In the Helike Society’s search for the lost Classical city of Helike, they discovered ruins of Classical buildings buried 3m deep in contemporary Helike mid-plain. 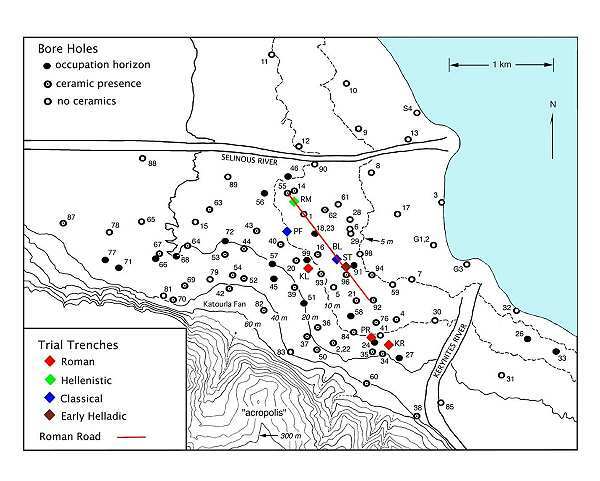 Near the Classical ruins, they discovered a well-preserved Early Helladic settlement (ca. 2400 BC) with large rectilinear buildings flanking cobbled streets, preserving their contents intact. Their discoveries in the Helike plain also include remains of Early Hellenistic buildings and a well-preserved Dye-Works site (ca. 300 BC), the Roman road 2km long through the Helike plain, occupation layers of Mycenaean and Geometric periods, a Late Classical cemetery of tile-covered tombs, remains of Roman buildings and cemeteries. Geoarchaeological work of their team brought to light the ancient lagoon under which the Classical and Early Helladic ruins are buried. 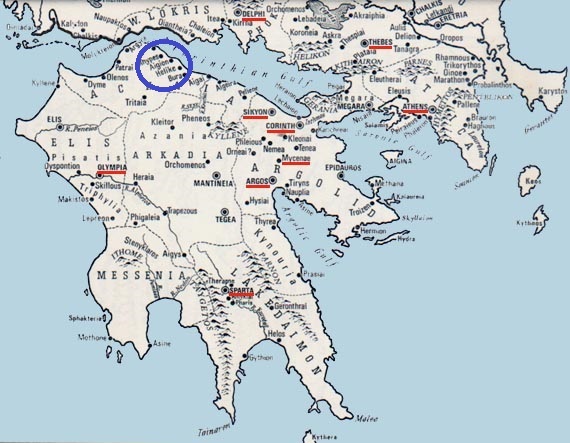 The area of Ancient Helike in Achaia. CLAIRE CATACOUZINOS: Can you tell us where you were born, and a little about your early childhood? DORA KATSONOPOULOU: I was born in the city of Aigion in Achaea. Memories from my early childhood are just beautiful and pleasant. I grew up in a family with much love together with my one beloved sister. Many uncles, aunts, and cousins surrounded me with care as both families, my father’s and my mother’s, had a lot of members; the usual case in Greece of the last century. CLAIRE: When did you decide that you wanted to be an archaeologist and how did you do it? DORA: Quite early. First, while at elementary school I imagined myself as a teacher and used to gather the other kids around me in order to teach them. Then, in early years of high school I decided to become an archaeologist, mainly because my father’s passion for history had inspired me. CLAIRE: When did you first come across the story of Helike and what drew you to discover it and why? DORA: I first heard about Helike and her myth from my father who used to bring me books of history to read. By finishing high school and ready to enter University, my purpose was clear and well aimed in my mind: I would do everything to solve Helike’s riddle and discover the place, thus fulfilling the deepest wish of my fellow-citizens, since the discovery of Helike was for our region a dream of generations of all times. CLAIRE: What are some of your most memorable experiences and your most exciting discoveries at Helike? What contributions have these discoveries had on the research of Ancient Greece? DORA: To answer this question would take pages of narrations. Excavation is by itself a memorable experience every day, every find that the pickax of the archaeologist brings to light is unique in its own merit. Of course, certain discoveries have a sort of a wider value, I mean not only to the archaeologist but also to the public. In the list of the most exciting discoveries in Helike, I would include the discovery of the rare prehistoric cup known as “the depas amphikypellon cup”, a pot of an extremely beautiful shape and of a particular meaning as the discovery of such a cup in a settlement of the 3rd millennium BC suggests the existence of a ruler and hierarchy and a proto-urban character for the settlement. Especially since the Helike cup is unique for the entire western Greek mainland so far. Another exciting discovery was when we found, for the first time, the remnants of a house destroyed by the most famous earthquake of antiquity, the earthquake of 373 BC which destroyed Helike and placed her in the sphere of the myth associated with the destruction of Atlantis. The feeling of bringing back to life the remains of the destruction brought upon a place is quite moving besides exciting. The discoveries made in Helike so far have contributed greatly to our knowledge of a lost civilization of Classical Greece, quite well said as “a lost Classical Pompeii of Greece”. Dora writing the excavation diary from the Geometric site (8th century BC). CLAIRE: Has there ever been a bad day working on the site, or a bad experience? DORA: A bad day on the site could happen for several reasons, something could go wrong at a point. For example, sudden rain or some damage in tools would stop the work at a critical moment of the excavation. I remember that we lost a whole day of work once when the pump used to pump out waters from the excavation trench was damaged, and not to mention the running off to the neighbour city of Aigion to fix it so that we would not lose another day of work next. CLAIRE: When you excavate at the site, how much research do you have to do about the era you have discovered? DORA: An excavator is continuously conducting research to be able to interpret its finds correctly and in comparison with similar finds from other places of the same period. But, in addition, to this very detailed comparative work, he or she must be acquainted with all different periods of antiquity in order to have a necessary broader picture within which falls the particular era of the excavation. In Helike, for example, the knowledge of this broader picture helped me enormously, as we have brought to light settlements and finds almost of all periods starting from the 3rd millennium BC down to late antiquity, and even to the late Byzantine times (14th/ 15th centuries AD). CLAIRE: What are the steps to conducting and directing the Helike Project? DORA: Conducting and directing the Project is a whole different procedure than the scientific part of the work carried out. The Director of an excavation is a manager, besides the scientist, and must be capable of doing a lot of different things. Handling bureaucracy to secure necessary permits for the work, finding the financial support for carrying out the work, choosing the proper collaborators in any particular field associated with the excavation work and the studies of the finds, guiding the trench masters and participants involved in the excavation, handling communication with the society and the authorities of the area where the excavation is conducted. These are just some examples of the main tasks of the person directing such a Project. CLAIRE: If you could conduct your dream project, what would it be? DORA: But, of course, Helike. CLAIRE: Have you had a mentor that has helped you achieve your success, or who inspired you during your time becoming an archaeologist? 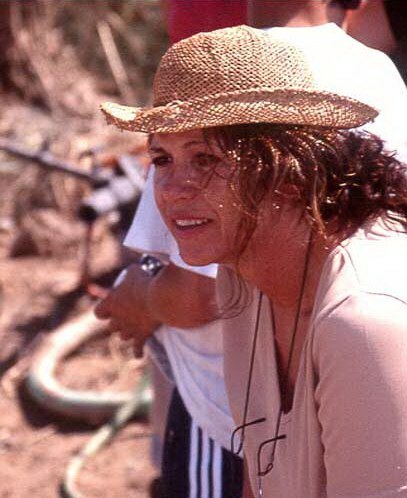 DORA: Two persons I would say that have played a significant role in my involvement and success with the field of archaeology. My advisor Professor John Coleman at Cornell University, where I completed my PhD studies in Archaeology, and the work of the late Spyridon Marinatos, a leading figure in Greek archaeology of the last century, who also was involved in the search for Helike before us. CLAIRE: If you could start over again, would you do anything differently? DORA: The only thing I would do differently applies to handling bureaucracy around an excavation. General view of the early Hellenistic (3rd century BC) Dye-Works site at Helike. CLAIRE: What are your thoughts on the state of the archaeology field in Greece? Do you think more should be done, and if so, where? DORA: This is a huge topic to enter. Field archaeology in Greece should become, in my opinion, a leading field worldwide. On the contrary, so far it is a quite closed field, mainly because it is considered that this way our cultural heritage is better protected. However, I believe that certain regulations, if applied, can still keep protection there, and at the same time, will open the field to Greece’s benefit. CLAIRE: Who is your favourite ancient Greek god and why? DORA: Poseidon, not only because he was the patron god of Helike but because his very nature of both a food provider for humankind as god of waters, but also as a destroyer when he sends the earthquakes and tsunami drowning people and places, really intrigues me. CLAIRE: What advice would you give to aspiring archaeologists? 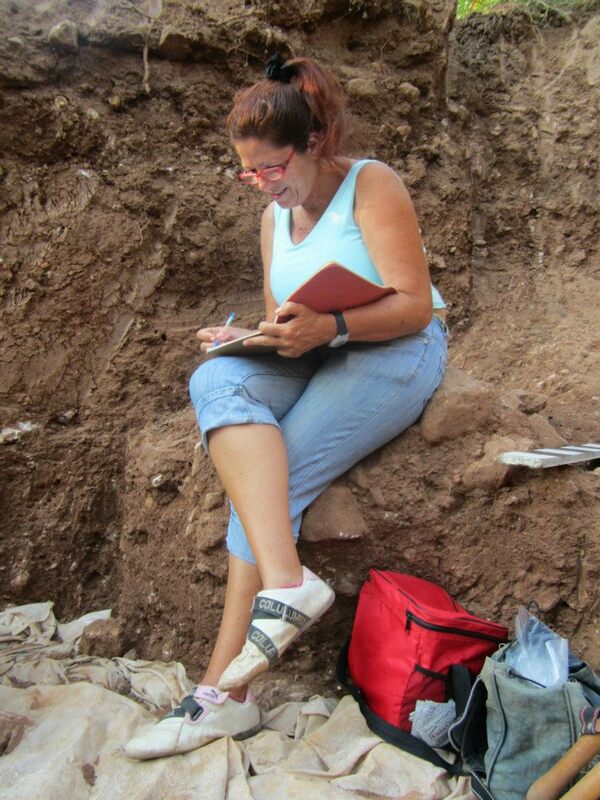 DORA: Archaeology means passion, decisiveness and dedication. If you think you have that, you can go ahead and try it. CLAIRE: Are there any new plans to start another Project in the near future, or your heart is set on Helike? DORA: I would not exclude starting another Project in the near future, but even if I do that, Helike will not be abandoned. There is a lot more to do there for years to come, and for me, Helike is certainly my one lifetime Project! CLAIRE: Lastly, has there been a year set for the Helike VI Conference, and when will the Helike V volume be published? DORA: The Helike V volume editing work is in progress and I estimate that it will be published by the early months of next year, so 2016. The Helike VI Conference is scheduled for 2017 and will be dedicated to Helike and its colonies in the ancient world. Dora Katsonopoulou teaching a volunteer to select ancient pottery. For more information about The Helike Project, visit their project’s website. You can also like the Facebook Page of The Helike Society to receive regular updates. And don’t forget to check out my short story Helike cited at The Helike Project’s website.